"Love and Guts" is a traveling group art show featuring work by legends in the skateboard community. The show is loaded with tons of great paintings and photos, free sushi, good vibes, a mild media circus and of course skaters hanging out and enjoying themselves. 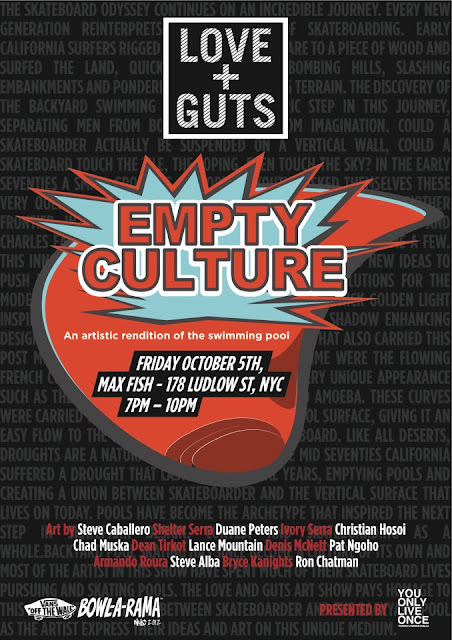 Featured artists are Christian Hosoi, Stacy Peralta, Steve Caballero, Pat Ngoho, Lance Mountain, Chris "Dune" Pastras, Jimbo Phillips, Jason Adams, Mofo, Bryce Kanights, Steve Saiz, Chris Senn, Josh Rodriguez, and Daniel Cuervo.Lo To celebrate the first Bowl A Rama contest in the Big Apple, Love and Guts art Show "Empty Culture" hits NYC on Friday October 5th at Max Fish kicking off from 7pm! Presented by You Only Live Once, part of the official festival of the skateboard\ - Vans BOWL-A-RAMA NYC 2012.